Full disclosure: I’m not referring to just any organic farm. 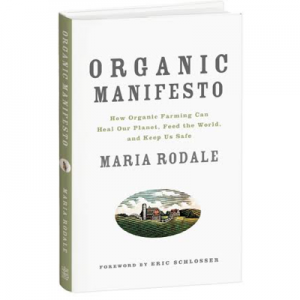 This is a Rodale Institute organic farm. It’s not just any hospital, either. It’s a hospital based in Bethlehem, Pennsylvania (my hometown), which had the courage to do something that only one other hospital in America has done: find a way to grow organic food to help nourish and heal its patients, staff, and community. Congratulations to St. Luke’s for having the vision to understand that the way food is grown is critical to the health of the people the hospital serves—and the environment they live in. They are pioneers in a world where you can find fast food for sale in a number of American hospital cafeterias. Good for the leadership team at St. Luke’s for understanding that the real value of healthful, organic food is in the money saved by preventing disease in the first place! On a recent autumn day, I stopped by the farm on St. Luke’s Anderson Campus to check in with Lynn Trizna, who has farmed the land from the beginning two seasons ago, starting with just a few acres the first year and increasing it to 10 this year. The farm now yields around 45,000 tons of produce, which is being shared between St. Luke’s six hospitals. The field of autumn crops. 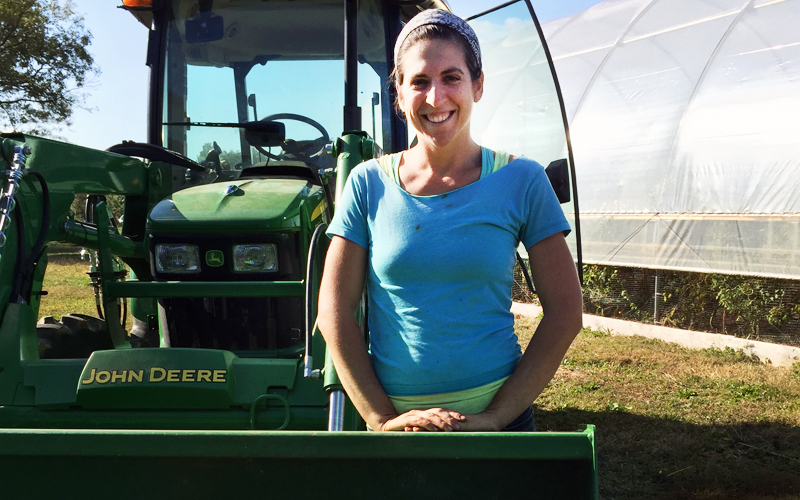 Being a farmer is hard work, but it’s Lynn’s dream job. She handles everything from planting the crops to building the greenhouse (bought with the generous support of the St. Luke’s Ladies Auxiliary—go, ladies!) and raising deer fences. It’s been a learning process. Sodexo, the food service provider, has had a hard time getting staff to be excited about cleaning and cutting up whole vegetables that they used to receive pre-cleaned and pre-chopped. And while you and I (and Lynn) might understand the appeal of an heirloom tomato, most people just want to eat the plain-old perfectly round ones. Organic cherry tomatoes’ last gasp in the hoop house. As I always say, we have to start where people are and take joy in the small victories. When she told me that one person exclaimed with awe, “I didn’t realize vegetables had a smell!” I laughed with surprise so hard I had a coughing fit. I’m not a farmer myself, but as a longtime gardener, I know the utter difference between something freshly picked and something that’s been sitting on a shelf. For me, it was hard to believe that someone had never been able to smell a vegetable before. It’s not easy being on the front lines of change—especially for Lynn, being a woman in a man’s world (farming, food services, and hospital administration are still predominately run by men). But she’s up for it, and she’s making it work. In fact, she’s leading the way—for farmers and for hospitals…and for women, too! I was so happy when I visited the farm to see things I’d only read about—everything from bringing goats in to eat the poison ivy and clear land to planting daikon radishes as an overwintering soil conditioner (which I learned about from Bill Mollison 25 years ago, but had never seen in action). 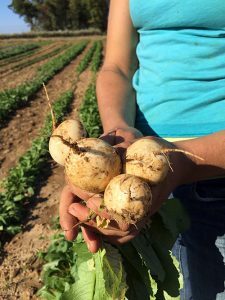 Lynn’s cover crops were in for the winter, and the fall crops of cabbages, radishes, kale, and turnips were thriving. She pulled out some Hakurei turnips for me that I ate for dinner that night. They were sweet, juicy, and fragrant. 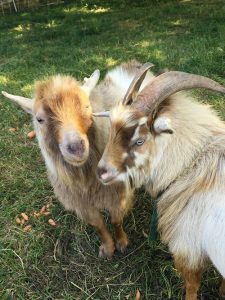 This father and son goat team have done their job clearing the poison ivy from the farm. 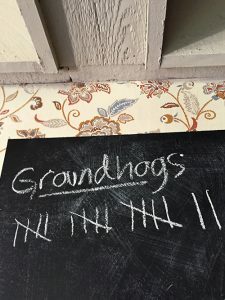 These groundhogs have been “disqualified” from clearing the farm’s vegetables. Lynn and her just picked Hakurei turnips. It’s hard to quantify in spreadsheets the value of real food that is fresh and organic. 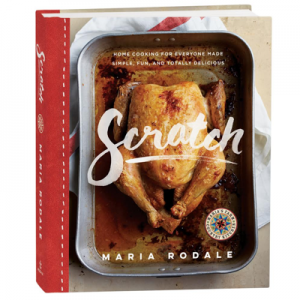 In many ways, we’re having to reteach people how to cook, how to prepare, and how to enjoy foods that they have only known in processed form. However, there are not many things in life that are more healthy, happy, and healing than fresh organic fruits and vegetables straight from the farm. 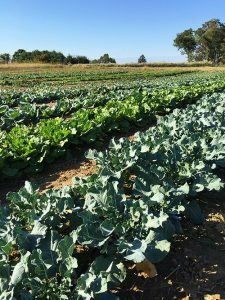 Can Organic Agriculture Really Reverse Climate Change? eating organically and inspire everyone to do away with GMO, processed frankenfood! Way to go Lynn and Rodale! Keep up the good work. This seems like such a simple thing! To feed people the freshest food, for healing and happiness. After recently eating a hospital meal, I was appalled that this was being served to patients. Must work on this, and thanks for the info! Wonderful. I love to follow your example. 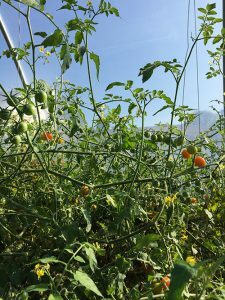 I’m have a permaculture and sustainable farm in beautiful Bowen Island, BC, Canada Love to visit you and see your wonderful efforts in promoting healthy living. Such wonderful story and very inspirational. Well done. I hope this program is just a beginning for a larger movement. Thank you. This makes my heart sing. When my 90 year old dad was in the hospital in April for an operation, it made me sick to see what was on the menu at the hospital. We were bring him food from home. YES!! !